Secret Weapon just for your seedlings: your own newspaper pots! Oh hey, this post contains an Affiliate Link, which means if you click on it and buy something, I’ll make a few pennies, which will help me support my blogging activities. That is all! My friend Jamie, a delightful person and a bonafide market gardener and (as if that’s not enough!) an extraordinary cook, was sitting at our drama practice one night, folding newspapers into pots. Her daughter is in our drama group. How clever Jamie is, thought I. She always knows just what to do. Here’s my secret: ever since I’ve known Jamie, I’ve wanted to be just like her. 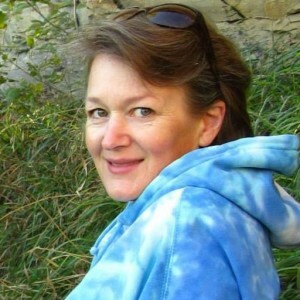 She’s an amazing friend, with lots of highly-regarded (and not just by me!) skills. So when I hear Jamie talking, I always inch very closely to her to listen and learn. I doubt if she’s noticed this. I can be quiet, when pressed. And so, on this particular occasion, I inched closer, to hear her talking with another drama mom about why she was making these nifty little pots out of newspaper. Apparently she was going to be planting sweet peas the next morning (doesn’t everybody know that they don’t like to be moved out of plastic pots?) and needed biodegradable pots–if I remember correctly, she needed about 40 of them–to plant the seeds in. She didn’t have time to place an order for some, and she didn’t want to make a run to the store for just a few pots. Well, what do you know, thought I, as I walked back to the rehearsal that I was supposed to be directing, now distracted by the visions of seeds and delicious springtime dancing in my tired head. I had a couple of envelopes of sweet pea seeds to plant, also, so of course I decided right then and there that I would blatantly copy my friend’s idea, since now I knew that sweet peas didn’t like to be transplanted. Jamie, after all, always has the BEST ideas. And I’ll bet there are other seedlings that don’t like the notion of having the plastic pot ripped from their delicate wittle woots and would also benefit from being planted in biodegradable pots, too. And how very, very pleasant not to have to go out into this wretched wind and the Arctic Cold Front that’s supposed to blow in this very night, to buy some little pots at the store. Not that I’m bitter about winter lasting FOREVER. Not that we could all use a little warmth out there. A little green. A little flower. A little leaf, or two. No. I’m sorry, Gentle Reader. I know that I shouldn’t complain. I know that I should get that whiny tone out of my voice . . . But . . . . but . . . c’mon! It’s going to be MARCH in a few days. Ole Man Winter just needs to . . . move . . . on . . . BUT the forecast! Barely a single day with an above-freezing temperature for the next week! Even hardy old prairie women like me are apt to get discouraged by it. Snif. There. Complaining session Over. Done with. Kaput. Back to the paper pots: Watching Jamie make the pots, I suddenly I had a very good idea of what I was going to do with my hands, the next time that Amalia or little Mack asked me to sit down and watch a movie with them that I had perhaps watched 246 times before. You know that pull, don’t you, Gentle Reader . . . the “I don’t feel good please watch ‘Finding Nemo’ with me Mama” pull, when your to-do list is longer than your arm, and yet those sweet blue-green pleading eyes are looking up at you, and you relent . . . and sit down and watch “Finding Nemo” one. more. time. At least, it’s a very entertaining movie. But this time would be different: you’ll have a stack of newspapers and a bit of masking tape and an old pop bottle (or something the appropriate size) and you can make paper pots and watch the movie and make your child happy, all three at once. You’ll be happy too. He may actually even help you, occasionally, when you can’t get the paper pot off the bottle, by giving it a manly tug as you hang on for dear life. Isn’t it satisfying to make something useful out of nothing? You bet it is. 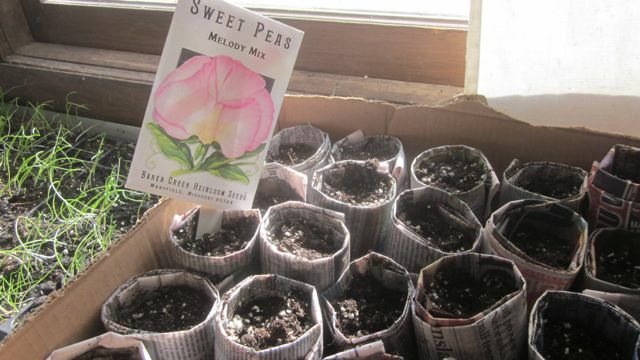 So here’s what you can do: today, put your sweet pea seeds to soak (they do better if you soak them overnight first, and I learned that from reading the seed envelope) and sit down to make a few newspaper pots for them. It’s easy. It’s fun! It’s a perfect end-of-winter project to keep your hands busy while your brain and heart dream of spring. Spring. Isn’t that a nice word, on this cold, windy, February day? I’ll say it again: Spring. Ahhh. *I’m kicking myself, now, for tossing all those excellent plastic containers from Sam’s Club that the organic baby lettuces and spinach come in! They would be just perfect to put the paper pots into. Oh well. Next year. Lay your newspaper flat. I use at least two layers, but four will work too, if you have plenty of newspaper. Fold down the top few inches. Try not to get too distracted by the story on top. 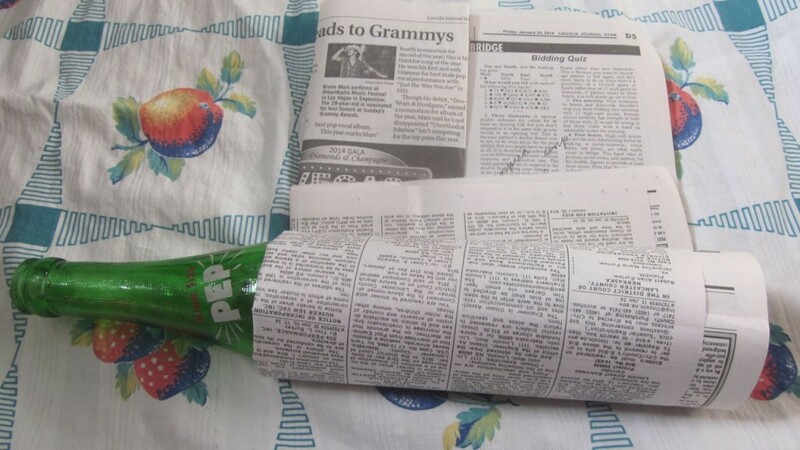 Roll up the newspaper on your pop bottle, and then put a piece of tape (this is optional but makes it so much easier) on it to hold it together. Leave several inches of newspaper on the bottom of the bottle. 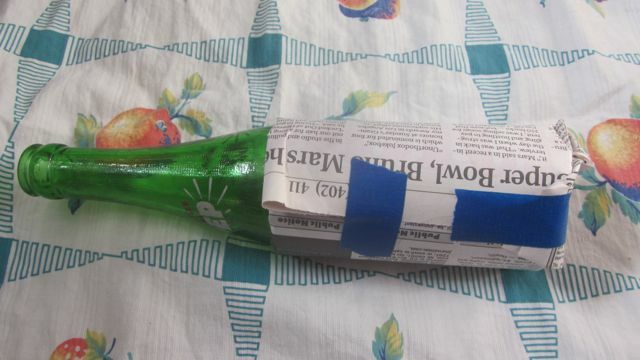 Fold the newspaper at the bottom up against the bottle, and tape again. Pull the bottle out (a little help might be nice, if you’re a tight roller, like me) and ta-daa: your very own biodegradable newspaper pot! Cost: nothing! Or, at least, almost nothing. Doesn’t this just make you feel happy inside? Line your newspaper pots in a box or a tray with high(ish) sides, fill with seed starting medium, and you’re ready to plant! Hooray! And the movie isn’t even over yet! I love this little man of mine so much. 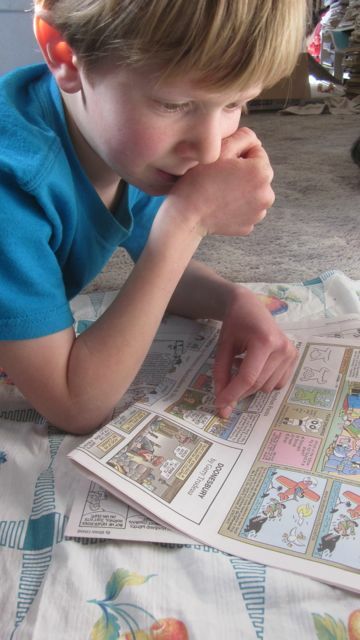 When he wasn’t helping me tug the bottle out of the paper pots, he was reading the comics to me. I’m sharing this post with the nice folks over at The Prairie Homestead–come on over and join me, won’t you? SALE on quarts, Buy One/Get One Freeeee! Oh, hey, I don’t usually do this, but this is such a great deal, I just have to mention it . . . Tropical Traditions (this is where I buy my coconut oil for my morning Bulletproof Coffee) is having a sale on their quarts of coconut oil: buy one, and you get a second quart free! Great deal! Click on the picture above to learn more, or to take advantage of this great offer! 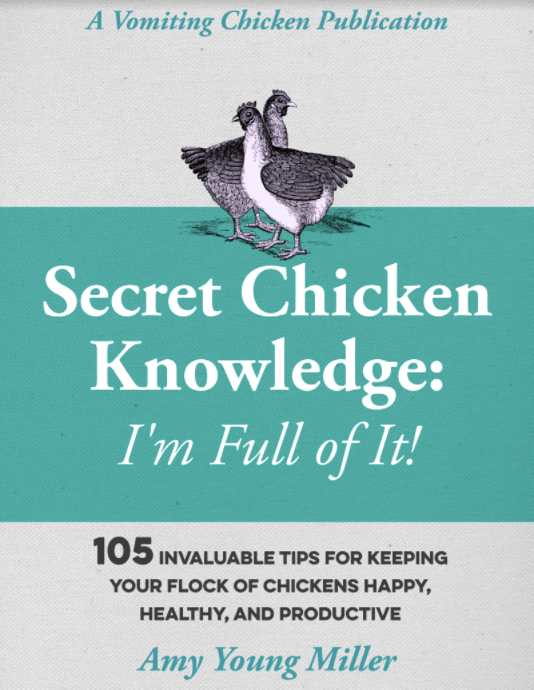 ← Sprouting grains for chickens: has it come to this? I’ll bet I know who your friend Jamie is! Do you know that she can change diapers, make paper pots AND create six bridesmaids’ bouquets all at the same time? And I’ll bet that you have some of those multi-tasking skills too. Anyone who home schools multiple kids has got to be able to do that. I would be totally helpless at it – typical single-focused male that I am! I turn off my phone and my helpers are forbidden to talk to me when I am sowing seeds. I love this little glimpse into the way you work. And I agree with you about Jamie: I can imagine her doing just what you described, and all without a drop of sweat! When I lived in small towns, my newspapers were mostly white, with a little ink. But the NY Times is heavily inked (and filled with biocides to keep the microbial levels low), as is the Wall Street Journal… I’m not sure they would qualify as “biodegradable”- they degrade, all right- but not all is right. I’ve never heard of those biocides, Roy. What I’ve read is that most newspapers have gone to soy ink? Great post! I never thought of paper pots to start seeds in. Thanks as I was going to start on those this weekend. It’s so easy to make a pile of these pots, Richelle, and I hope you enjoy planting in them! Awesome tips! i actually called my wife reading your blog. thank you for sharing! It sounds like your wife is very smart about what she chooses to read, Richard! Creative ways to use newspapers! I never would have thought of that! Thanks for sharing! I’ve never heard of them, either. I had read that most newspapers were now using soy ink. My worms live happily in a bin full of newspapers shredded, too. This is a perfect activity. Doing something useful gives such a feeling of satisfaction. Wish I could join you and little Mack. I’d be right there, rolling the paper around the bottles, dreaming of the sweet peas to bloom next summer. OH Francene, I would just love that. I would brew a big pot of English tea (if, indeed, that is what you prefer? ), and we could talk and make pots and solve every one of the world’s problems. Little Mack could be the pot-puller-offer. I love Finding Nemo! It’s such a cute film! Your little newspaper pots are a great idea. I’m all for recycling Amy. It’s so easy to come up with ways to re-use newspapers around here. I never throw them away, and the slick colored pages that can’t be used in my garden, can be tossed in the recyling bin. Yes, I have heard of this but never did it…now you’ve got my attention! I have already planted all seedlings but always have some strays or need to plant more. My snap peas are already 1-2 feet high and looking beautiful. We just got a good rain so can’t wait to check them. Woodchipped the raised beds and going to plant green beans tomorrow. Yes, my friend, spring is just around the corner!! You will smell it in the air soon! You’re WAY ahead of me, but it’s beginning to warm up here and spring couldn’t come fast enough for me!